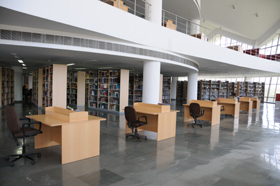 Bibliographic Service – IDSA Library offers local catalogues, e-resource management services, abstracting and indexing for print journals along with web links of articles within subscribed journals. Reference Service - The reference desk provides users information and advice on materials available in the library including collections and services, as well as on the multiple sources from which information can be accessed. Selective Dissemination of Information (SDI) - SDI is provided to researchers in their specific or current areas of research. SDI refers to tools and resources used to keep a user informed of new resources on specified topics. Information is collected from various library and internet resources around the world against specific requests from the Institute's researchers. Referral Service – Also known as Information and Referral Service (I&R), this involves referring users with specific queries to various sources such as professional organisations, research institutes and individual specialists and their contact details. Inter-Library Loan facilities and document delivery services are available through DELNET for researchers at the circulation counter.